The Body Shop Comes to the Rescue! Being pregnant and in my final trimester, as soon as it got even remotely hot I blew up like a puffer fish! My feet, ankles and legs blended together into two giant stumps! So delightful! After I’d ruled out preeclampsyia (very serious, get yourself to GP ASAP if you exhibit any of the symptoms), I pretty much did anything I could think of, or Google told me to do, to help myself. I blogged about it here. After trying lots of different things, I’ve found the absolute best cosmetic intervention in the quest to re-establish some kind of ankle definition comes from the lovely Body Shop! Peppermint Cooling Foot Lotion (£3). What a bargain! A lovely pepperminty foot moisturiser. I keep this in the fridge to help with the cooling down! I wouldn’t think it would do anything to cool your feet if it wasn’t kept in the fridge. If you can reach your feet (this is a daily struggle for me right now!) then it’s a great aid for massaging away any fluid retention around your ankles. 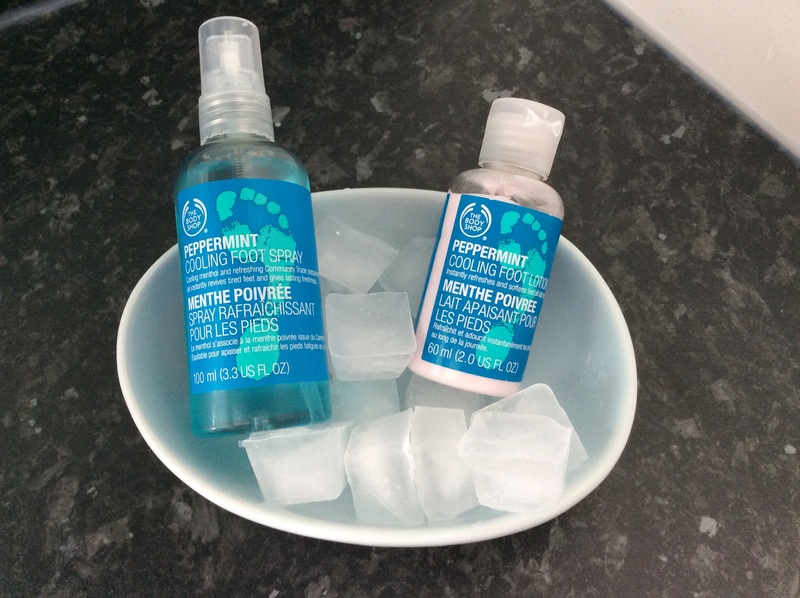 Peppermint Cooling Foot Spray (£6). Slightly more expensive than the lotion, but definitely worth it. Again I keep it in the fridge, and spray very liberally all over my feet, ankles and up my legs. I’m not sure it cools on contact because of anything within the product, I think it works because I keep mine at a low temperature and the minty scent seems to fool your mind into cooling you down. The scent is really strong, so I’m sure it would help with stinky feet, or for an afternoon freshen up in the office! It’s a strong peppermint rather than a toothpaste type scent – think mint humbugs if your unsure! There are other products in the range that might help. There is a foot soak that you could add to a bucket of cold or even iced water if you are feeling brave! I have spent some time stood in a small paddling pool full of cold water when my water retention has become really bad! Try it! Loves – both products are very good value, have a lovely mint humbug scent and both last quite a while. Not so Loves – the cooling sensation is psychosomatic unless you keep the products in the fridge, which I highly recommend! Overall – the best cooling, anti-fluid retention products I’ve found on the market. I would say essential if you are pregnant in the heat!